The Blaise Pascal magazine #4 is out. Inside you can find a second part of my “enumerators” series (first page). 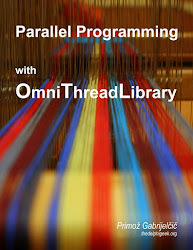 OmniThreadLibrary 1.01 has been released yesterday. It is available via SVN (http://omnithreadlibrary.googlecode.com/svn/tags/release-1.01) or as a ZIP archive. [GJ] Redesigned stack cotainer with better lock contention. [GJ] Totally redesigned queue container, which is no longer based on stack and allows multiple readers. Full D2009 support; D2009 packages, project files and Tests project group. Added enumerator to the IOmniTaskGroup interface. Added automatic comm unregistration for IOmniTaskGroup.RegisterAllCommWith. IOmniTaskControl.Terminate now kills the task after the timeout. 2 -> 2, 1 -> 4 and 4 -> 4 tests for stacks and queues. [1, 2, 4] -> [1, 2, 4] full tests. Writes CSV file with cumulative test results. 17_MsgWait: demo for the .MsgWait decorator. 19_StringMsgBenchmark: Invoke benchmark, ReceiveWait demo. 21_Anonymous_methods: Anonymous methods demo (D2009 only). Message ID $FFFF is now reserved for internal purposes. Better default queue length calculation that takes into account OtlContainers overhead and FastMM4 granulation. Bug fixed: TOmniValue.Null was not really initialized to Null. Bug fixed: Setting timer interval resets timer countdown. Bug fixed: TOmniTaskControl.Schedule always scheduled task to the global thread pool. Current versions of 3rd part units included. Thread pool is not stable under high load.